Italian painter. He was a student of the Late Mannerist artists Francesco Vanni and Ventura Salimbeni. 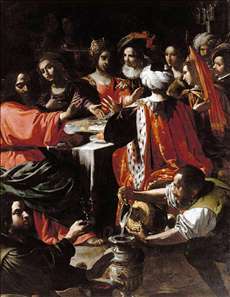 His earliest paintings, and especially his frescoes illustrating the Story of St Catherine and Pope Gregory (1597; Siena, Palazzo Pubblico) and his altarpiece of the Baptism (1599-1600; Siena, S Giovannino in Pantaneto), are strongly influenced by their works and also those of Federico Barocci. Although his style changed considerably during his career, Manetti never fully abandoned the fleshy, oval facial types with delicate, sweet features and the cluttered compositions that typify Sienese Mannerism. From 1600 to 1610 his paintings, for example the fresco cycle of the Story of St Roch (1605 to 1610; Siena, S Rocco alla Lupa), drew on the clear narrative style, naturalistic light effects and particularized figure types of Florentine painters such as Bernardino Poccetti and Domenico Passignano. His trip to Rome in 1615 brought him into contact with the paintings of Caravaggio and Guercino, amongst others, and his paintings take on a much stronger, more naturalistic, and altogether more "caravaggesque" feel after this date. 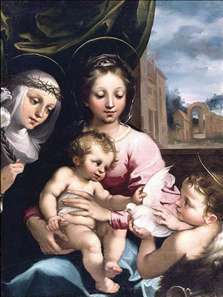 See more details about "Madonna and Child with the Infant St John the Baptist and St Catherine of Siena"
See more details about "Wedding Feast at Cana"